Many have attempted to take on Wendy's brutalizing Twitter account, and many have utterly failed to inflict even slight damage. While most brands have learned to tweet clear of Wendy's 140-character blows, the square-shaped burger purveyor has found a sparring partner that brings a secret weapon to the ring: ferocious bars. Yes, none other than Wingstop has stepped to Wendy's on Twitter, and the two accounts were quickly locked in a fierce rap battle. It all started with a viral tweet, which compared a funny picture of a Wingstop to the lyrics of a Migos song. (The lyrics go "Raindrop, drop top," compared to the image, which shows a GameStop neighboring a Wingstop in a strip mall). Wendy's spat some PG-13 verses that were kind of impressive for a hamburger chain. But the battle of the brands ceased there. 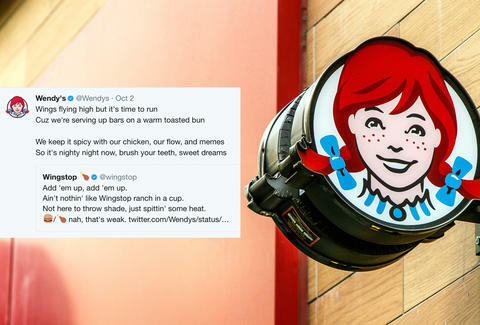 Wendy's was the first to tire out and thank Wingstop for its participation in what was probably the only rap battle waged on the internet between two prominent eateries. Wingstop kept it real, too. Whether or not another fast-food rap battle will rock the idle waters of Twitter anytime soon remains to be seen. In the meantime, watch this space, and maybe send a prayer to Carl's Jr's Twitter account, which could definitely benefit from learning how to rap.